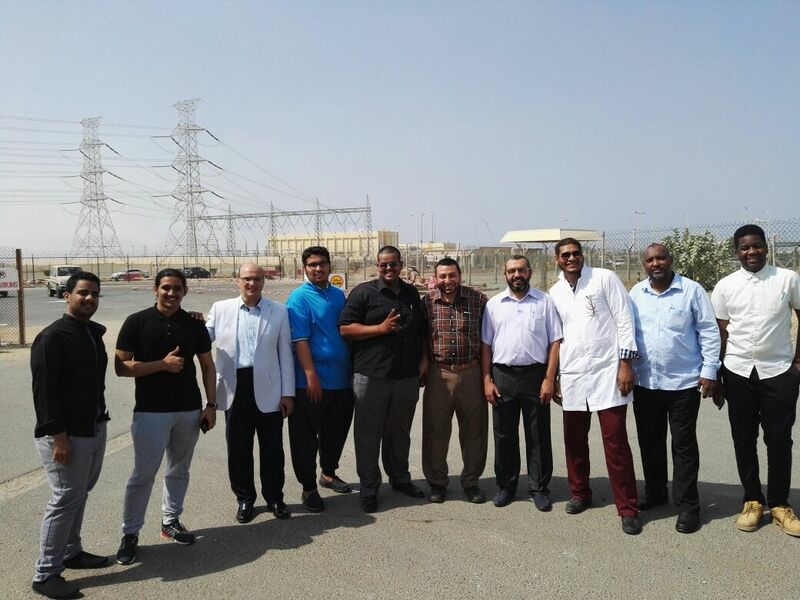 With the support of Dr. Tawfiq bin Ali Al-Sharif, Dean of Al-Jamoum University College, and under the direct supervision of Dr. Sami bin Abdullah Al Harbi, Chemistry Department Head, the Department of Chemistry organized a scientific trip to Petro Rabigh Company on Wednesday, 26th April 2017. The trip members were warmly received by Mr. Ammar Fad'aq, Public Relations Officer at Petro Rabigh. Mr. Fad'aq expressed his warm welcome to the group and thanked the Department for its keen interest in students and introduction of them to the practical reality and future planning after graduation. Then, he obtained field visit permits within the company for all members of the trip. Students and staff members toured the company's central control unit, accompanied by Eng. Saeed Al-Ghamdi. Moreover, they reviewed the processes of oil refining and processing and naphtha, gasoline and kerosene production. They also saw the manufacturing units of monomers (such as ethylene glycol and propylene oxide) and polymers (such as polyethylene and polypropylene). On the other hand, students commended the level of the company and the scientific benefit from such visit. They also wished to repeat the visit to similar companies, in order for them to be qualified after graduation to join such companies and keep pace with the labor market. It is worth mentioning that such visit came within the framework of the care by the Department of Chemistry at Al-Jamoum University College for its students to ensure them the highest level of distinguished scientific quality that qualified them for competition with their counterparts at various universities. At the end of the visit, a partnership was formed between the Department and the Company to take advantage of the Company's capabilities to support the educational process in the Department.